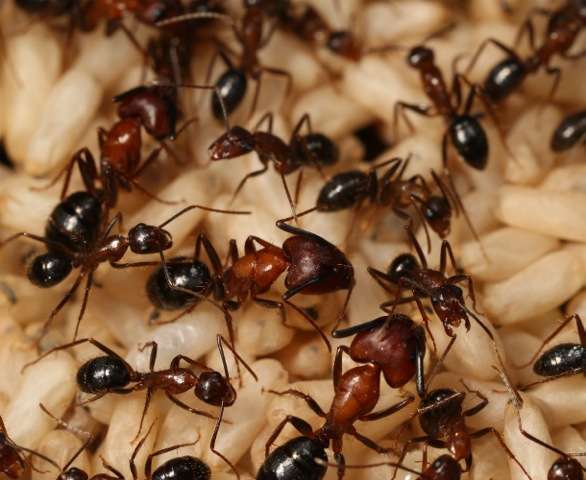 Florida carpenter ants castes, major workers and minor workers, taking care of the brood. These are one kind of ants the researchers studied. The cuticle of the workers and the queen is enriched with specific hydrocarbons, many of which act as pheromones and are sensed by others in the colony. Credit: Juergen Leibig. Ants, which are eusocial insects, have intrigued scientists for long as a model for cooperation inside a colony where they nurse the young, gather food and defend against intruders. Most recently, ants have been shown to cooperate when transporting big chunks of food, they have been studied for how they manage to keep clean, and they have been examined also for why most of them in a colony are lazy. Add to this list now how ants identify different members of their colony from other colonies. Scientists at the University of California, Riverside have found that ants communicate using a number of hydrocarbon chemicals present on their cuticles (their outer shells). Reporting today in the journal Cell Reports, the researchers note that ants, which have evolved some of the largest families of olfactory receptor genes in insects, use their powerful sense of smell to sense the chemicals present on the cuticle of individuals to precisely identify the different members of their society. "Until now, very little was understood about how ants use olfactory detection of pheromones to recognize individuals belonging to different castes or different colonies in their societies," said Anandasankar Ray, a neuroscientist and an associate professor of entomology, who led the research team. "To address this problem, we decided to focus our attention on the worker ants' antennal neurons and their responses to hydrocarbons on the cuticle. What we wanted to study was how ants detect sophisticated pheromones which organize their behaviors efficiently into colonies, and help recognize individuals from different castes, the queen, and non-nestmate intruders." Ray explained that social insects like ants have remarkable ability to organize into large colonies with multiple castes participating for the colony to succeed, and like any large society this coordination requires effective communication between individuals. His lab applied a powerful electrophysiology method, to systematically test hydrocarbons present on the worker and queen cuticles that have previously been suspected to act as pheromone cues. "To our surprise we found that these very low volatility compounds are not only detected sensitively by the ants' specialized antennal sensors, but almost all of the hydrocarbon components are detected," Ray said. "This broad-spectrum ability to detect hydrocarbons by the ant antenna is unusual and likely a special property of social insects. Using this high-definition ability to smell 'ant body odor' the ants can recognize the various castes in the colony as well as intruders." Recognition of individuals at very close proximity in a large crowd in a colony is facilitated by use of low volatility cuticular hydrocarbons. A more volatile cue would be confusing to associate with an individual, and could overwhelm the olfactory system in the colony by constantly activating it. Ultimately each ant cuticle has a blend of several cuticular hydrocarbons. The precise composition of the blend could be a useful solution for coding information on several castes both inside a colony and intruders from outside a colony. In a way, each of these individual hydrocarbons act together in a "chemical barcode" which other individuals in a colony use for recognition of an ant's caste or nest. These two tasks are feasible not only because ants have a sophisticated olfactory receptor system with the largest odorant receptor gene family (more than 400 genes) known in insects, but also because they have remarkable abilities to learn and behaviorally discriminate closely related hydrocarbons. "The evidence suggests that this large number of receptors is probably needed to smell out the complex bouquet of hydrocarbons each individual emits," Ray said. "We are closing in to finding the functional roles of these receptors, and, in particular, finding the olfactory receptors that detect pheromones from the queen who regulates much of the order in the colony." Ray explained that the prevailing model, proposed in 2005, suggested that worker ants could preferentially smell only non-nestmate cuticular hydrocarbons, and not smell the hydrocarbons from nestmates. "This model started to seem unlikely after we found how broadly the worker antennal neurons can respond to hydrocarbons," he said. "When we tested this with our sensitive electrophysiology assay we found that ants can indeed detect both nestmate and non-nestmate cuticular extracts, as we had predicted." Simple Test: Take out 2 Ants. At the same time take out 2 more Ants from a different Ant Hill. Without Delay, Mix them up & release them back Immediately into those same 2 Ant-Hills. Then, See What happens to them--Whether They recognize their Colleague OR Not! Also Bring 2 neighbouring Ant Hills together & Start an Ant-War between the two crowds. I am tired of reading reports of futile research work....Wasting Research Funds. These belong to 3 Centuries earlier even pre-dating Darwin. Darwin did Sailing to other parts of the world which was a tough & risky thing to do in those times! People should be working this research at their homes as hobby not with tax payers' money. If the guy was serious about the 2005 model being the prevailing one than science really has a problem. That model is ludicrous on its face. The ants can hardly see so how were they to detect each other in the colony if they did not do it by scent? It is dark in an ant colony, most are underground, there is no light which leaves scent for everything. No wonder junk science gets such a high proportion of air time in the PC world of today, junk is the new prevailing order.